While everyone is excited for a big, four-way crossover between Supergirl, The Flash, Arrow, and DC's Legends of Tomorrow, longtime Arrow fans were a little peeved when they did the math and realized that Arrow's blockbuster hundredth episode will fall right in the middle of the event. In the past, midseason events have been used as launchpads for The Flash and Legends of Tomorrow, something that some Arrow fans argue has been to the detriment of their favorite show. Now, in what should be a celebration of Arrow, they're worried that other superheroes will be stealing the spotlight. 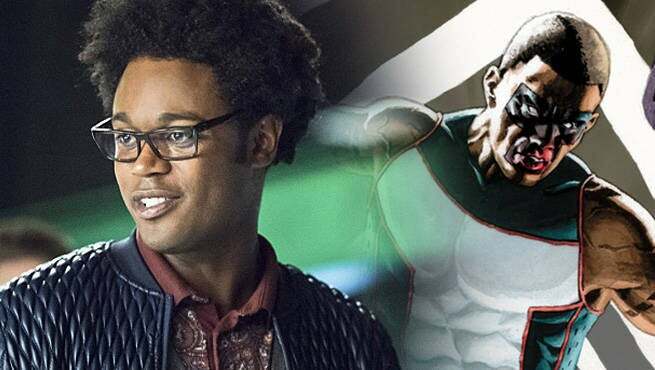 Well, don't worry about that, says Arrow's Echo Kellum, who plays Curtis Holt on the hit CW drama. There's a lot to balance, including a bunch of special guests from Arrow's own past, but they're managing it. "I definitely think we are handling our Arrow business and still doing this crossover," Kellum told ComicBook.com. "I think that's a good thing, especially for this magnitude of an episode. I know that the last few crossovers were helping set-up other shows, but there's no element of that here. Every show here is an already-established show. If you're doing a crossover to help setup Legends of Tomorrow then, logically, you're going to have to spend some time dealing with these new characters who are coming in, because if you don't then you're doing a disservice to that new show." Kellum said that even though they don't spend a lot of time setting up characters and ideas in this year's crossover, be considers that kind of writing to be an investment in the future of the show and its shared universe. Episodes that set up new DC characters, he told ComicBook.com, are there so that when it comes time for the big crossovers, fans can sit back and enjoy them. He says taking time out to establish The Atom or Constantine on Arrow means they will "have a universe where comic book fans get to see characters from all over, and see them intersecting with each other in a way that's not been done before on TV." Now that it's been revealed that Curtis, Oliver, Felicity and the rest will be facing off against aliens in the form of The Dominators in the forthcoming crossover event, what can Kellum tease about the Invasion!-themed storyline? Not a whole lot, except to say how excited he is. "I literally, when I read those scripts, my mind was like, 'holy hell, how are we going to do all of this, are we going to all this, is this real?'" Kellum told us. "And we're doing it, and it's coming out great! [Director James Bamford] is back with us, and he's killing it as always, and I just can not wait for fans to see this crossover." The four-way crossover event is expected to take place in the first week of December, 2016. Supergirl airs on Mondays at 8 p.m.; The Flash on Tuesdays at the same time, Arrow on Wednesdays, and DC's Legends of Tomorrow on Thursdays. The Flash will debut its new episodes on The CW starting October 4; Arrow, October 5; Supergirl, October 10; and DC's Legends of Tomorrow October 13.